This is one of my favourite things to cook especially when I'm feeling sick or when I want something simple and healthy. It goes down easily and doesn't require too much jaw action. I made this for lunch on Sunday because I figured fish and chips would be too greasy and unhealthy for the kids (although we ended up getting them fish and chips for dinner anyway), and besides, I didn't have anything else to cook. This one is easy because I always have the basic ingredients, ie. eggs, mee suah (wheat flour vermicelli), dried shrimp ("hei bee") and dried anchovies ("ikan bilis") in my pantry. It's my life saver when there is nothing else to eat at home, or when I need something quick and easy. And it's delicious, of course! Heat up some oil in a wok. Fry garlic till browned and caramelized. Transfer onto a dish, leaving the oil in the wok. Add the dried shrimp to the wok and fry briefly. Pour the beaten egg over the shrimp to make an omelette. When it's cooked, break it up roughly with a spatula. add the fried garlic and 3 cups of water and bring to a boil. Simmer for about 5 minutes and add in seasoning. Prepare the mee suah by blanching in boiling water briefly until the strands start to separate and soften. Drain and transfer to a serving bowl. Toss and separate the strands with a fork so that they don't clump together. 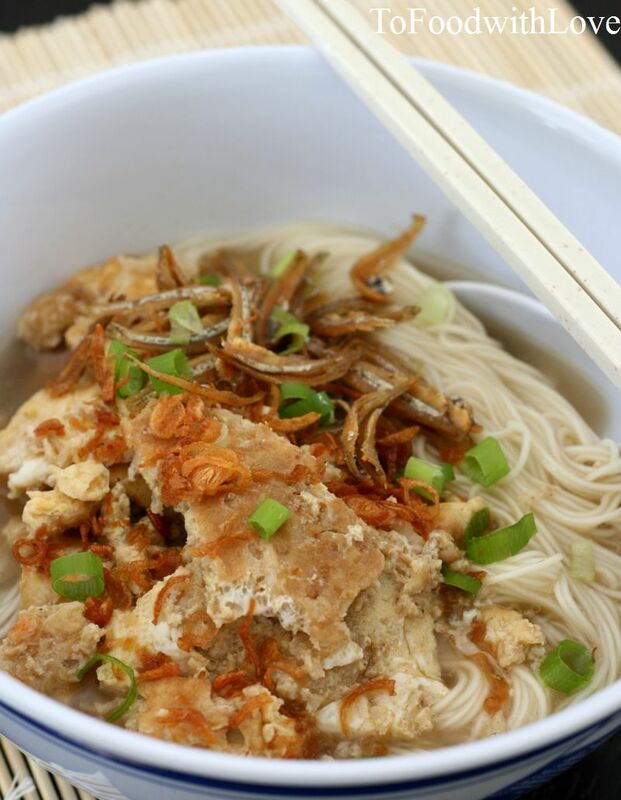 Ladle the omelette and soup onto the noodles and garnish with ikan bilis, spring onions and fried shallots. Serve immediately!